I am a huge fan of potatoes and onions, so this is right up my alley. Every fall this recipe seems to be a go-to meal that is pretty quick and easy – yet impressive and classic! I actually adapted my recipe from the Barefoot Contessa (a true culinary goddess in our eyes). Before watching the episode where she made the soup, I only knew of yellow onions (or Vidalia for us southerners), white onions, red onions, green onions, and maybe a little about shallots – leeks were a foreign idea. Who wants to pay $4 for a bunch of green onions that I have no idea how to cook?! Well, after I convinced myself that I could make something edible from them there was no turning back – and hence the recipe for one of the best homemade soups we make! 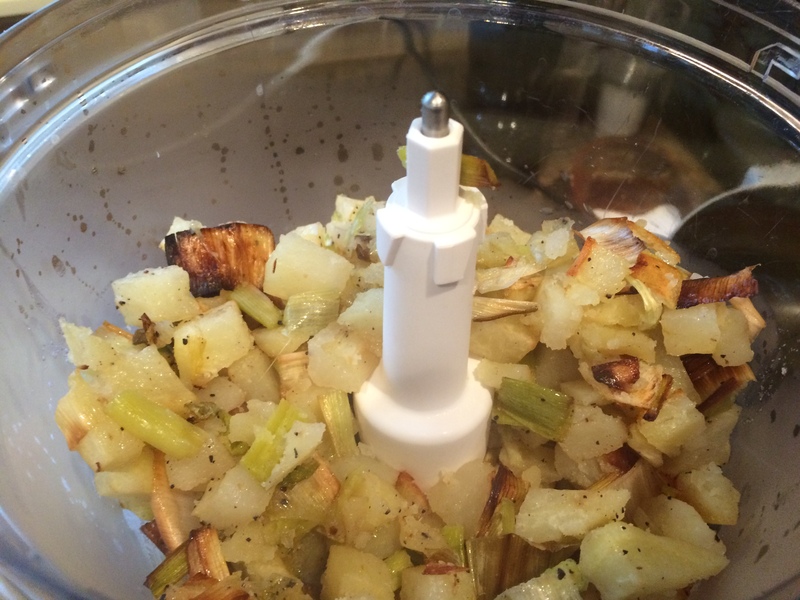 Peel and dice potatoes into 1/2 inch cubes and soak in bowl of water to prevent browning. 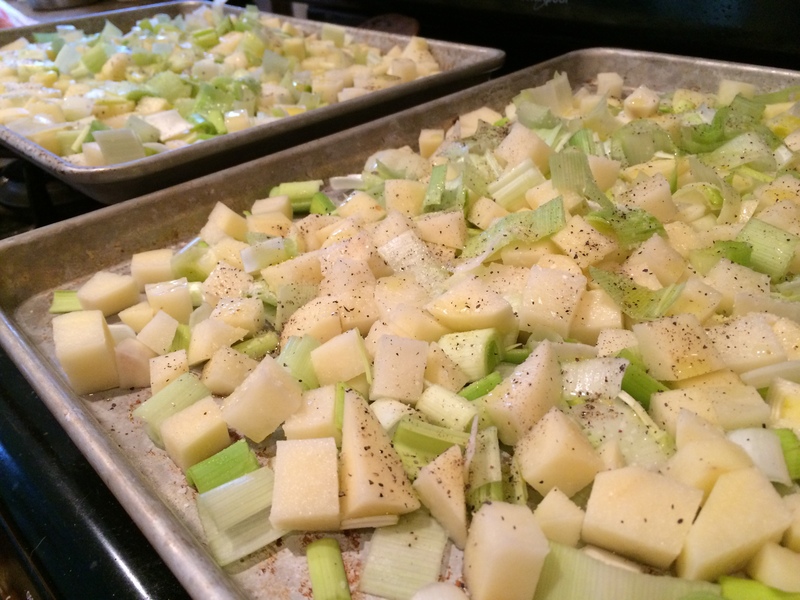 Cut white and light green part of leeks in 1/3 inch slices, then cut down the middle (making half circle slices). I sliced the leeks like a sausage, then cut each ring of onions in half, allowing the onions to separate. Add the cut leeks to a bowl full of water. Leeks tend to have a bit of dirt and sand between the layers. Once they are all cut, separate the layers and rinse them in the water. You’d be surprised how dirty the water will be! 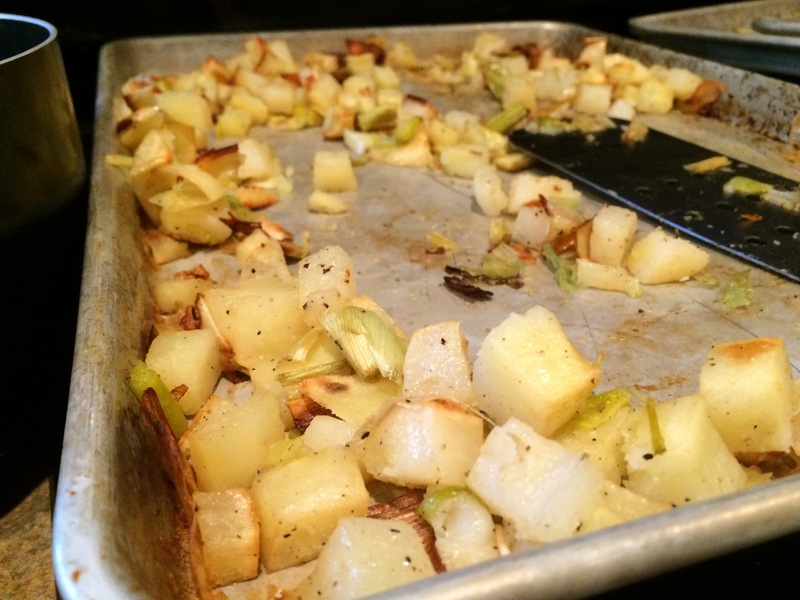 Once all the potatoes and leeks are cut and rinsed, add them to a large sheet pan. Add olive oil to the mix and lightly salt and pepper to taste. Put the sheet pan into the oven at 400 degrees and cook them for about 45 minutes, turning at least once. After 45 minutes, add 1/2 of the roasted mixture to your food processor. Add about 1/2 of the cream and about 1/2 cup of the white wine before starting the processor. Process the mixture until it is smooth and add to a large soup pot on the stove. Repeat with the remaining roasted vegetables. NOW for the fun part. Deglazing! Put the sheet pan over a burner at medium high heat and add the wine, scraping all the delicious burned/stuck bits off the pan. Add those to the food processor, blend and add that to the pot as well – those burned bits add a TON of flavor. Heat the mixture in the large soup pot. You can add additional wine and/or cream to adjust to your liking. Also add a little S&P to taste as well. Tip: when processing the roasted vegetables in the food processor, don’t feel like you have to completely clean out the processor after each portion. Sometimes, the leeks have “strings” to them, like celery, that will get caught on the blade – leave them on the blade for a smoother soup!